How Many Ways to Factor?!? Factoring is known as a technique to resolve numbers/sequences or make numbers/sequences resolvable into factors. 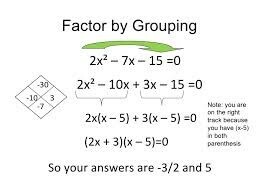 There are several ways to factor, for example completing the square or simply taking out the greatest common factor (GCF). However, there are also different methods, such as factoring by grouping and factoring 2 cubes that are used for certain types of polynomials or binomials. However, factoring does not just revolve around techniques, but it also involves theorems, such as the Factor Theorem. For more information about these concepts, read below and have fun! Factor by grouping is used for a polynomial with four terms, or a quadratic. In order to factor, you need to group the first and second terms together and the third and fourth terms together. Read the steps below to understand how to factor by grouping. 1.) Determine if there is a greatest common factor, or GCF, among the four terms. If there is a GCF, factor it out and put it on the outside of the parentheses. Do not to forget to include the GCF as part as your final answer. 2.) Next, group the first and second terms together and the third and fourth terms together. 3.) Factor out a GFC from each group if possible. Be sure that the binomials in the parentheses are the same among the two groups. In the second group, you may have a choice of whether or not to factor out a negative. If it is necessary to factor out a negative to get the binomials to correspond, make sure you do so. 4.) Now that you have corresponding binomials, the GCF's of the two binomials are grouped together to form another binomial. Now, you should have two binomials, one consisting of the original and corresponding binomials and one that is constructed of GCF's. 5.) Finally, using your binomials solve for x, as you would in any equation, by setting the binomials equal to zero. Here are some practice problems, give them a try! 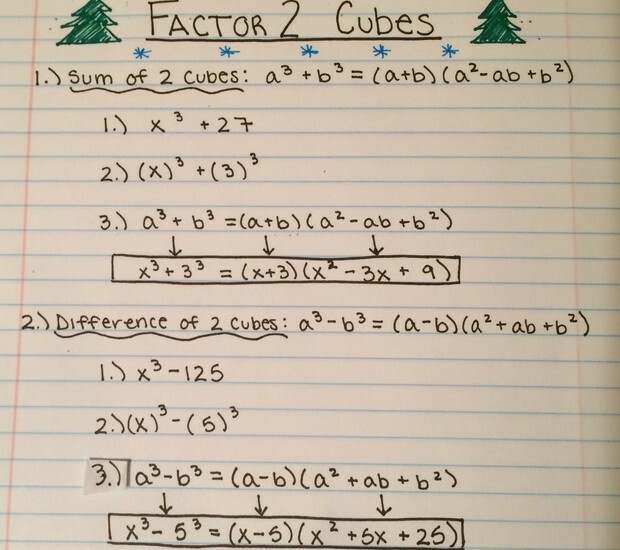 Factoring 2 cubes is used when there are two cubes in a binomial. Read the steps below to help guide you! 1.) Determine whether the two terms have anything in common, or a greatest common factor. If they do, factor out the GCF. Do not to forget to include the GCF as part as your final answer. 2.) 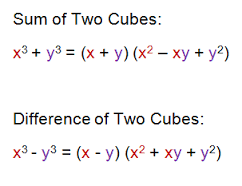 Rewrite the original problem as a difference of two perfect cubes. 3.) Use the following sayings to help write the answer. a. "Write What You See"
c. "Same, Different, End on a Positive"
3.) Use these three pieces to write the final answer. Use the equation given and plug in your values. 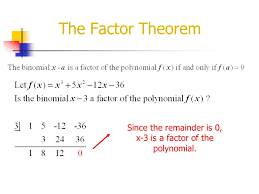 The Factor Theorem states that the binomial (x-a) is a factor of the polynomial f(x) if and only if f(a)=0. This means that if you synthetically divide by (x=a) or algebraically solve for a polynomial by (x=a), and get zero for a remainder, then x-a is a factor of the polynomial. 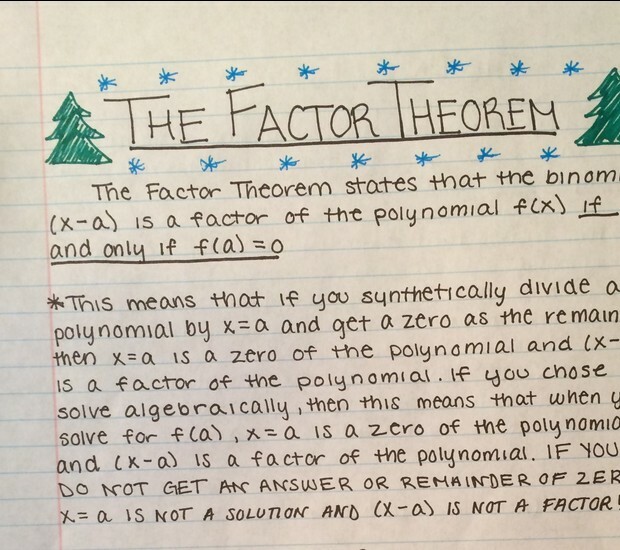 Below there are examples of the factor theorem using both synthetic division and polynomials to solve. 1.) Using the polynomial given, begin by factoring solving for x. 2.) Use one solution to synthetically divide the polynomial. 3.) 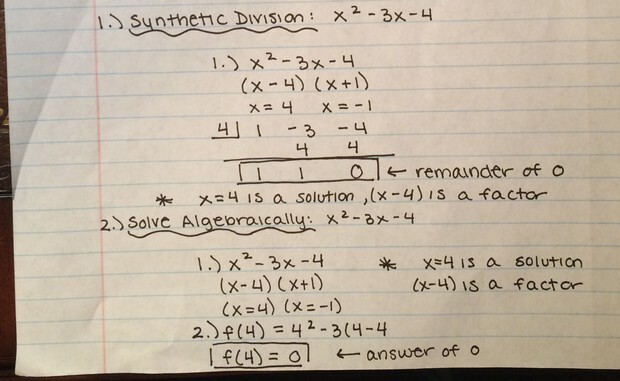 Divide the polynomial by one solution of x using synthetic division. 4.) If the remainder of the problem is zero, (x-a), a being one solution, is a factor of the polynomial and x=a is equal to zero. 5.) If the remainder of the problem is not zero, (x-a), a being your solution, is not a factor of the polynomial and x=a does not equal zero. 1.) Using the polynomial given, begin by factoring and solving for x. 2.) Use one solution to solve algebraically. 4.) If f(a) is equal to zero, (x-a) must be a factor of the given polynomial and x=a must be a solution. 5.) If f(a) is not equal to zero, (x-a) is not a factor of the polynomial and x=a is not a solution. 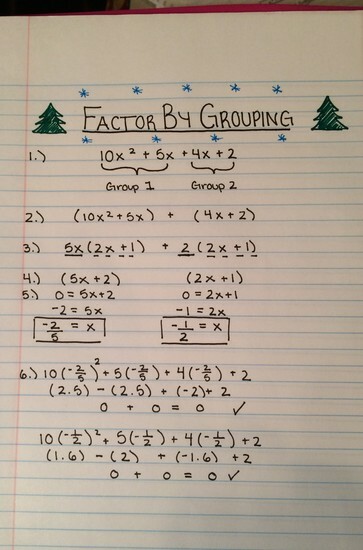 Factoring by grouping is used when there is a quadratic, or a polynomial with four terms. 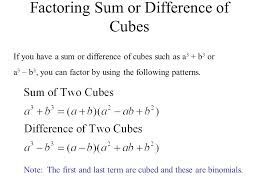 Factoring 2 cubes is used when a binomial, or a sequence with only two terms, has two cubed terms. 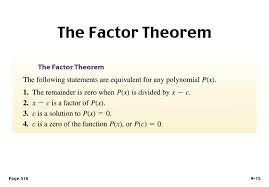 The Factor Theorem identifies a binomial as a factor of a polynomial if and only if f(c) is equal to zero. By using these methods, it is easy and simply to solve the polynomial or binomial at hand.